The Literature Festival is definitely my favourite event in the Dubai calendar and I look forward to it every year like most women look forward to the Harrods sale. I became a ‘friend’ of the Festival last year and decided it was worth doing again: you get use of the outdoor lounge, complimentary tea and coffee, reserved first and second row seating at all events and early discounted booking on all Festival events. I bought my tickets in January and once again, couldn’t wait for March! I’d booked four sessions on the Friday (Chimamanda Ngozi Adichie, Markus Zusak, David Nicholls and Jung Chang). On Thursday night I sorted out my books – I had three books by Chimamanda Ngozi Adichie (Americanah, Half of a Yellow Sun, That Thing Around Your Neck), The Book Thief by Markus Zusak, Us and The Understudy by David Nicholls, and Wild Swans by Jung Chang. I took them all with me on Friday so I could get my copies signed! My first thought when I got to the Festival this year was that it was packed. Much more crowded than the year before. 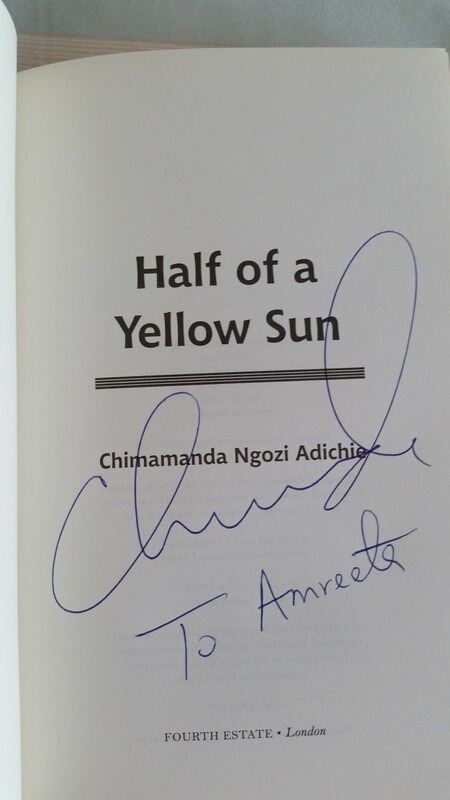 I got in the queue to see Chimamanda. Her session was from 11.30 to 12.30 – and she spoke to a room of 500 people bursting at the seams. I had a front row seat, but a little to the side, and I recorded the session on my phone but the quality wasn’t great so when I find a YouTube video of it, I’ll post it here. After listening to her talk, I feel like rereading everything she’s ever written. By this time it was 1.40pm so I got into the queue to meet Markus Zusak. As his session hadn’t finished yet, there was no queue and I was third in line. The woman at the front of the queue looked at me and smiled. I smiled back. ‘Amreeta?’ she asked. ‘Er… yes?’ I had no idea who this person was. And then she introduced herself – she was someone I’d been to school with. In Lagos. At the American School. 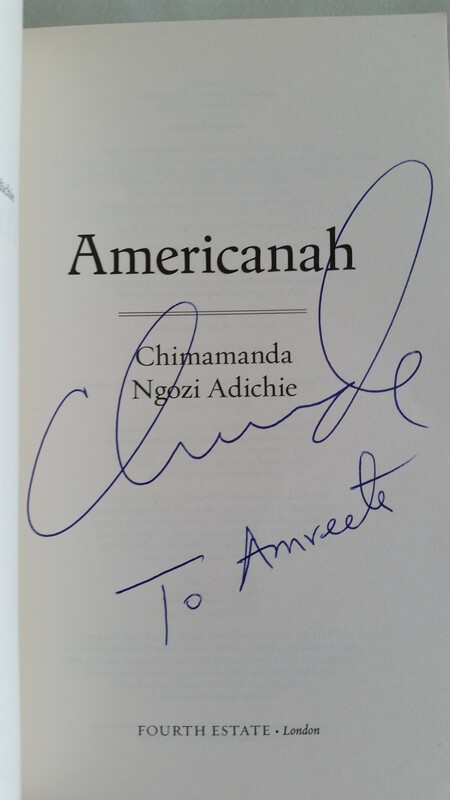 Which I’d just been talking about with Chimamanda. Is there such a thing as coincidence? I hadn’t seen her since I was 11 – we’re Facebook friends but hadn’t really kept in touch, and when I moved to Dubai we spoke on the phone a couple of times but never got round to meeting. I wouldn’t have recognised her at all. 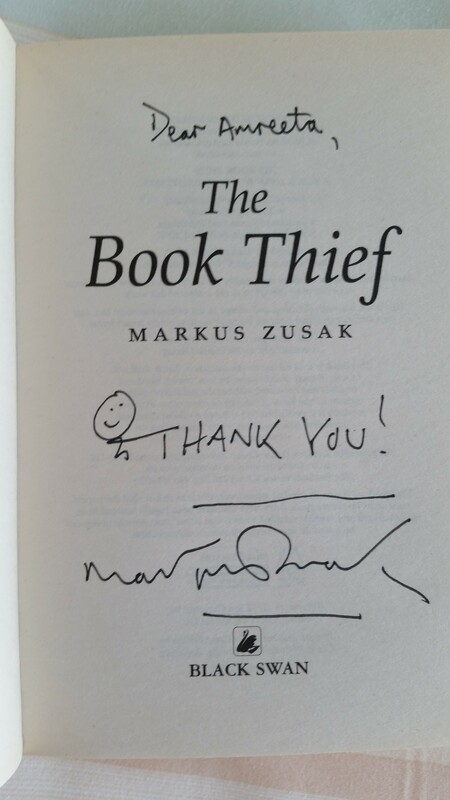 We chatted until Markus Zusak showed up – he signed my copy of The Book Thief and I went to meet my friends for lunch. We thought we’d go to Jamie’s Italian (where we ended up last year) only to find that it had closed down. Most of the waterfront area seemed to be under construction so we ended up eating at Choix at the Intercontinental. I would not go back there again. The service was terrible, the portions were tiny and they didn’t serve any alcohol. The three of us ended up ordering the risotto – and when it came, the portion was so small you could eat the whole thing in four bites. After ‘lunch’, we decided to go to Vista, the bar, for a drink – as our next session wasn’t until 4.30pm. We got a table outside and ordered some Pinot Grigio. The waiter poured us a taster but it wasn’t chilled so we sent it back. The next bottle he brought still wasn’t cold (I’m pretty sure it was the same bottle) but by this point I’d given up on every restaurant/cafe at the hotel. 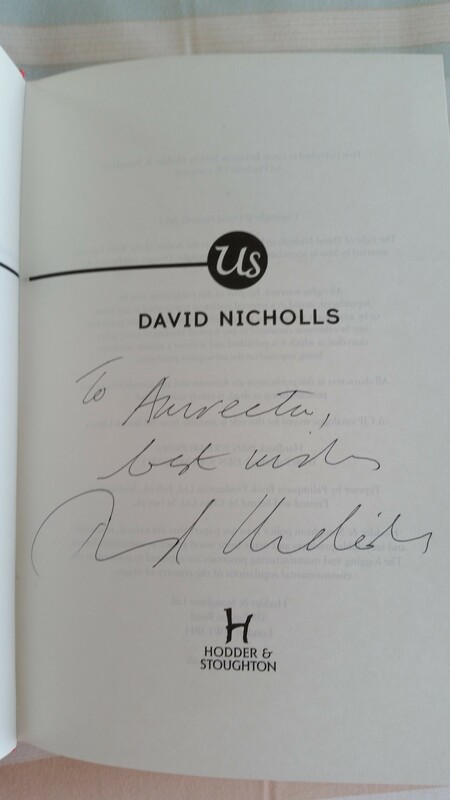 We drank our wine and then went to the David Nicholls session. I’d seen him in 2012, the first time I’d gone to the Festival – and he was just as funny. I didn’t record the session but now I wish I had. 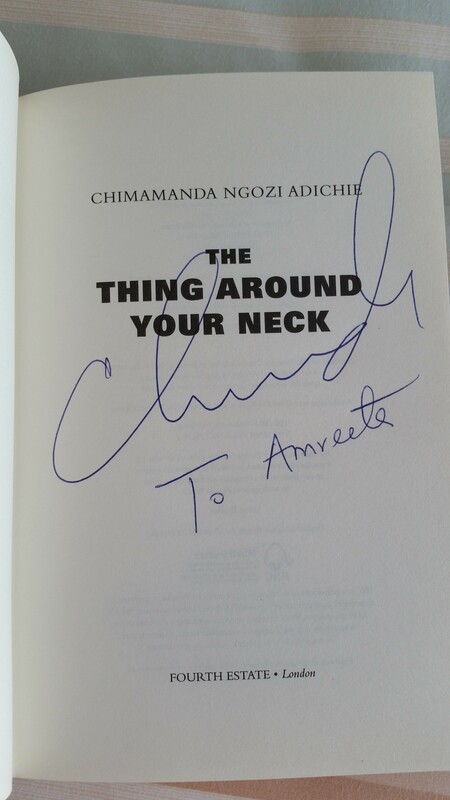 I did meet him afterwards and signed my two books for me. The last session I went to on the Friday was with Jung Chang. I’d read Wild Swans when I was 20 and still had my copy from back then. I’d started reading Mao: The Unknown Story when it was first published but I really had no idea what was going on and I gave up about 40 pages in. This session was about Chang’s latest book Empress Dowager Cixi: The Concubine Who Launched Modern China. I hadn’t read the book but it sounds like a period in Chinese history that is so fascinating – I’ve added the book to my list. 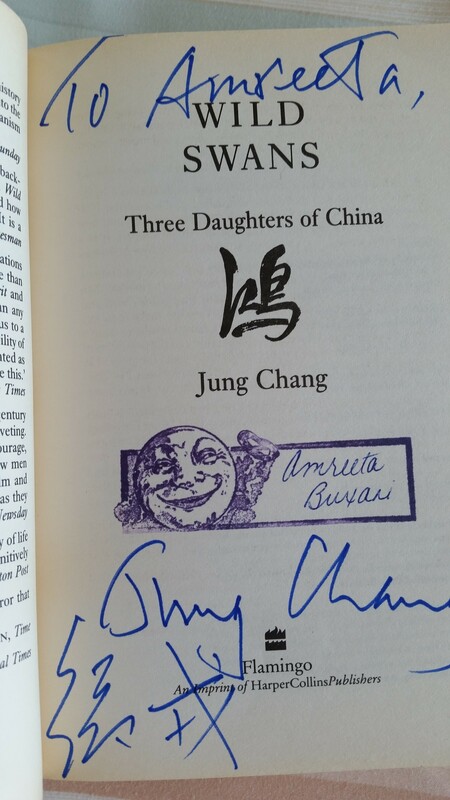 I also managed to record the session and met Jung Chang afterwards – she signed my old tattered copy of Wild Swans. It was a fantastic day out – and I’m already looking forward to next year!